At our Tulsa, OK dental office, we want every patient to have a great smile. We don’t just mean one that looks great, but one that also allows you to eat and talk normally. Unfortunately, eating and speaking can be difficult when you are missing teeth. Also, missing teeth can sap your confidence. If you’ve been living with a gap in your smile, we have good news for you: Dr. Cornell is trained in placing dental implants to restore both the form and function of your smile. Q: Is Replacing A Missing Tooth Really Worth It? Q: How Do Dentures Use Implants? A dental crown, which is a replacement tooth made to look just like the tooth it’s replacing, so it will look and feel natural in your mouth. An artificial root made from titanium, which simulates how a real tooth has a root. This is implanted into your jawbone, and it’s made from titanium because the body does not reject that metal. An abutment that connects the crown to the root. This way, if anything ever goes wrong with the replacement tooth, the root does not need to come out. Because implants are placed in the jawbone, they fuse with the bone and provide the same durability and strength as any healthy tooth. By getting a missing tooth replaced, you can regain self-confidence by knowing your smile looks great again. Replacement teeth can also help you eat your favorite foods again. Dental implants can last decades, meaning they improve your look and ability to eat for years to come. First, our team will make sure the area in question is thoroughly clean. Then, Dr. Cornell will make a surgical incision in the gums. The titanium root is placed and given time to heal. Once it has fused with your jawbone, an abutment or connector is placed on top of the root. Finally, a carefully crafted dental crown is placed atop the abutment. In some cases, we can even place the dental implant and replacement tooth in one visit. Because the root is implanted into your jawbone, the bone tissue there must be healthy enough to safely hold onto the root. 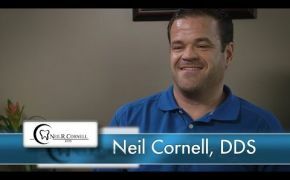 If there are any problems, Dr. Cornell may be able to perform a bone graft to make the area strong enough. Dentures are a great for when you need to replace all of the teeth on the top or bottom of your mouth. But sometimes they can move around in your mouth or even come out unexpectedly. To make sure your dentures are held in place, Dr. Cornell can use implanted roots. These are placed in your jawbone just like getting a single tooth replaced, but instead of putting a replacement tooth atop each root, the implants connect to your dentures. Dental implants are a strong way to replace missing teeth so you can talk, eat, and look normal again. Call us today at or email us to schedule your next appointment.